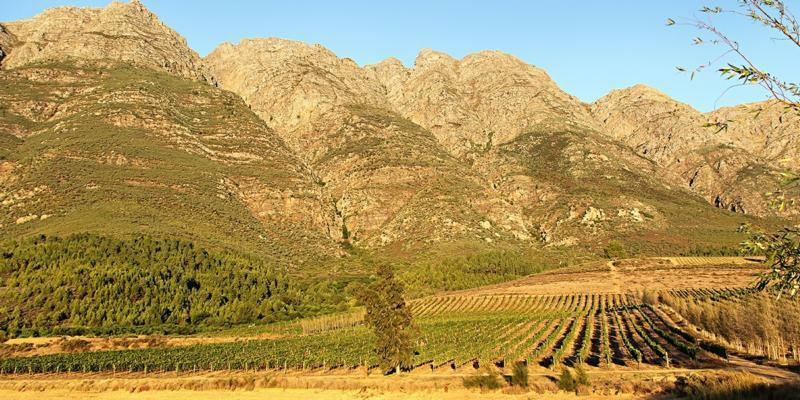 Charles Banks of Terroir Selections purchased Fable Mountain Vineyards in 2010, and he quickly fell in love with the sheer majestic beauty of South Africa. Our partnership with Terroir Selections has been very fruitful to this point; giving us an opportunity to sell fantastic domestic wines from Sandhi and Wind Gap. Now, we have the pleasure of adding this new winery to our book and making our first foray into the adventurous side of South African wine, and with snakes, baboons, leopards, and other wild animals roaming around Fable's vineyards in Tulbagh, this winery certainly is an adventure. Winemaker Rebecca Tanner and viticulturist Paul Nicholls are making world class wines at Fable Mountain Vineyards. Referring to the 2011 Syrah, Neal Martin from The Wine Advocate said, "the first word that springs to mind on the nose is "Clape." Tulbagh is a town located in the Cape Winelands of the Western Cape of South Africa. It is adjacent to the Swartland, which the Wine Spectator called "the industry's most exciting frontier," and has very similar climatic and terroir character. Fable Mountain's estate vineyards line completely within Tulbagh, up against the rugged slopes of the Witzenberg Mountain range, where 32 hectares of Syrah, Mourvèdre, and Grenache are planted at elevations of 400-650 meters. Fable Mountain also makes a white wine which is sourced from vineyards in the Swartland. The vines grow slowly in Tulbagh, as they do not have the luxury of much soil. They must work their way into ancient vertical shale. The mountains behind Fable Mountain Vineyards tower over the vines and have a critical influence to the uniqueness of the site. Every morning the mountain casts a shadow over the farm, which has a cooling effect. In the summer, this allows the grapes to ripen slowly, retaining great natural acidity, and in winter, the snowy peak helps keep the vines dormant for longer. The site is very challenging with bush fires, extreme weather, and natural dangers ever present during the growing season. Under the watchful eyes of Rebecca & Paul, the vineyard team at Fable Mountain uses a Biodynamic and deep agro-ecological approach to ensure that the integrity of the site is maintained. The winery on the property has a gravity fed cellar to process many small parcels of fruit that are brought in from the vineyards.